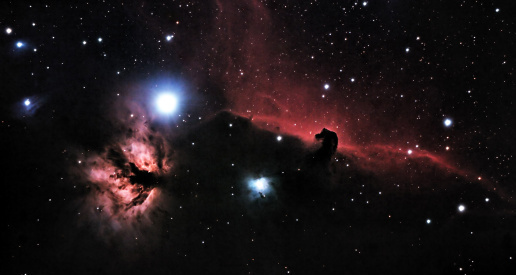 Horsehead Nebula, a LLRGB picture taken with Canon 20Da and WO FLT-110 without field flattener for FLT used. Exposure times,ISO800 5*8min=40min and ISO400 12*8min+1*12min=108min. Total=148min. Filter: 2" IDAS LPS. Guide via 16" LX200ACF and SBIG Camera ST-8XME; 23.Dec.-2008 and 2->3. Jan-2009.